As the starter gun went off at the Beau Vallon Regatta site, the finalists of the “Miss Seychelles…. 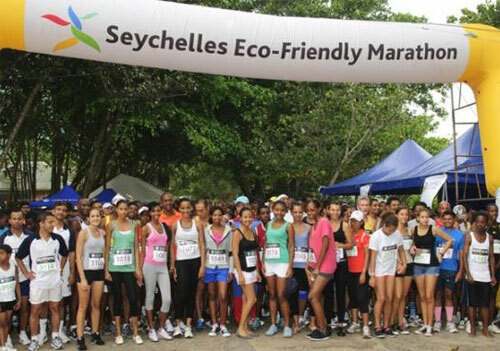 another world” candidates were ready to take on the challenge of the fourth edition of the Seychelles Eco-Friendly Marathon. All present for this international event organized by the Seychelles Tourism Board, the contestants who had enrolled for the ten-kilometers walking category, joined the more than 600 local and international participants to promote Seychelles as a sport tourism destination. One of the delegates, Stephanie Ernesta, has acknowledged that ”it’s the first time she had the chance to be part of such a prestigious event.” She added that although she prefers swimming over any other sport, she had a thrilled time walking the ten kilometers from the Beau Vallon Regatta Site to Bel ombre, all the way up to Hilton Hotel in Glacis and back to the starting point. Janice Hoareau and Diana Marie were mesmerized by the publicity that the “Miss Seychelles… another world” contestants gained when the news spread among the local and international marathons of their presence in the Eco-Friendly Marathon, outlining that the Eco-Friendly Marathon is a better way to showcase Seychelles’ beauty. For the “Miss Seychelles… another world” contestants, the marathon was not solely a means to see the beauty of the island through sport, but one in which they were able to meet with high government officials who are fans of the Eco-Friendly Marathon in a series of photo shoots. From the Designated Minister, Vincent Meriton; to the Minister responsible for culture, Bernard Shamlaye; the minister responsible for investment, Peter Sinon; and the Chairman of the Seychelles Tourism Board, Barry Faure; they all responded positively to the call of meeting the “Miss Seychelles… another world” contestants and being part of the family photos. As the “Miss Seychelles… another world” contestants enter into the sixth week of their training sessions, the momentum is ultimately building up for the finals, while the team spirit, which has been created among the girls, is stronger than ever.